You can choose from one of our courses listed below based on your past experience with clay, and your learning objectives. Each of these courses has a set number of sessions associated with it. For Beginners, who have little or no prior experience with clay, we recommend our Foundation Course. 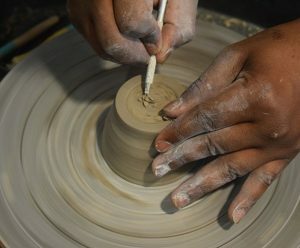 In order to enrol for a Course, you need to fill up the Contact Us form with details such as your past experience with pottery and the course you are interested in. We will send you course details. Once you have made payment, please send us a screen shot of the payment confirmation. Once we receive your payment we will send you a receipt and then you are enrolled! Once you have paid for your chosen course and are enrolled for it, you will need to contact us to schedule each session the day before you would like to come in for it. For example – if you would like to come in for the Wednesday afternoon session, you would need to contact us on Tuesday to book your session. 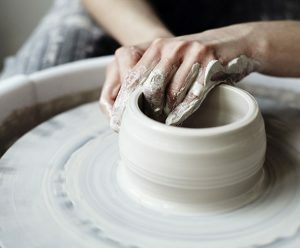 Session bookings are best done through email on info@theclaycompany.in, or via Text or WhatsApp Message on 8860951951. Please note – we do not take advance bookings. You have 6 months to complete your course because we realise how busy you are – be it work, travel, home, family – there are a million demands on your time. With our model, you never miss a session you have paid for because we give you the flexibility to come in any day that suits your convenience – just call us to give us a heads up. 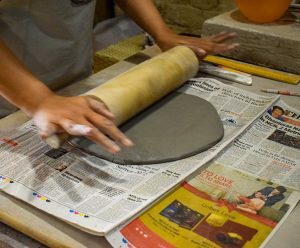 At our New Delhi studio in Nehru Place, we offer regular pottery classes as well as special interest workshops that focus on specific aspects of ceramics. Our Taster class is a single HANDS-ON session of 2.5 hrs. The objective of this single session is to give you a chance to experience our studio, its environment, our teaching style & most importantly, a change to experience the medium, ie. clay! Our basic course for beginners and is an introduction to pottery making. It is roughly divided equally between wheel work and hand-building. Objective of this course is introduce students to basics of hand-building and wheel work. 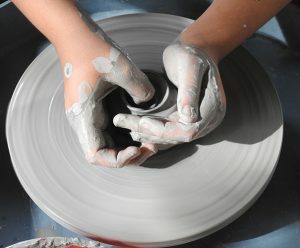 Focuses entirely on hand-building & the student does not work on the potters wheel at all. 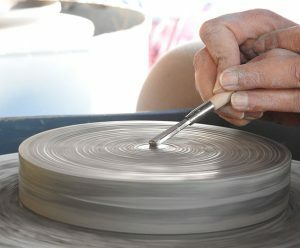 Enough time is spent on the 3 main techniques of pinching, coiling and slab work so the student understand how to work these techniques. This is an advanced course and is not meant for students who have little no prior experience with clay. This course focuses entirely on wheel work and the student spends all 14 classes on the wheel. There is no hand-building in this course. This is another course for the more advanced and experienced student as this is a course where the student determines the content of the course. You tell us what you would like to learn, and we help you learn that.